“How I Killed Pluto And Why It Had It Coming” by Mike Brown is a book about the discovery of some large icy objects in orbit around the Sun in the Kuiper belt. It tells the story of the discoveries of Sedna, Makemake, Haumea and Eris. You can find out how these objects were discovered and who were the scientists behind the discovery. It is a rather personal account, as Mike Brown was the leading scientist working on trying to find other objects past the orbit of Pluto. Besides finding out his thoughts and feelings on those objects, there’s also quite an entertaining (for the reader, though it probably wasn’t too entertaining for the author) part about how Mike tried to use the scientific method for raising his newborn daughter. For example he tried to find out whether or not the baby sleeps longer when she’s been fed by her mother or when Mike just gives her the bottle. And the birth of Lilah (Mike’s daughter) coincides with the announcement of some of the objects so he has to deal with a lot of publicity. There’s also some drama involved with the discovery of one of the objects, but you can read more about that in the book. Now one of the most important parts is the “killing Pluto” part. Do you have strong feelings for this dirty ice-ball? 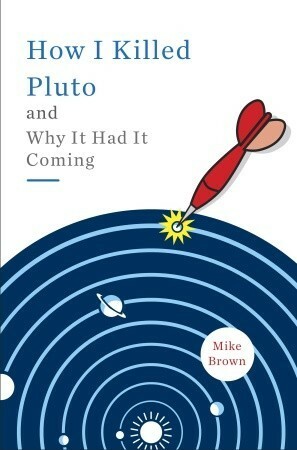 If you do, this book might not be for you, or maybe it might make one see reasons behind Pluto’s demotion… Mike Brown is “the killer of Pluto” because as there were new objects discovered near Pluto that were sometimes bigger than Pluto, then it became necessary to classify those objects. With asteroids it’s simple. But planets? Well the problem was that there was no definition for “planet”, only the concept of planet. And so when International Astronomical Union tries to get twelve planets into the Solar System, with Mike’s Eris being one of the planets, Mike starts an attack on the definition, showing why Pluto shouldn’t be a planet. And as you know, Pluto’s not a planet anymore, so if you want to know more about the back-story, of what happened and why it’s not a planet, read this book! This entry was posted in Astronomy, Non-fiction and tagged astronomy, astronomy books, book review, Eris, Haumea, How I Killed Pluto And Why It Had It Coming, Makemake, Mike Brown, Pluto, Sedna. Bookmark the permalink.